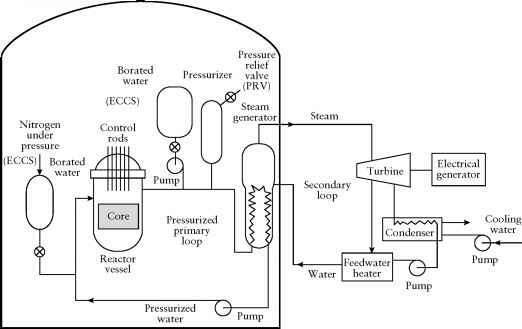 Several additional concepts for nuclear plants have been studied since the 1950s. Some were developed to the prototype stage, but all were abandoned. Three examples are the liquid metal fuel reactor (LMFR), a graphite-moderated device that had fuel consisting of uranium metal dissolved in liquid bismuth; the molten salt reactor (MSR), in which the uranium as a fluoride was dissolved in a eutectic mixture of the fluorides of Be, Zr, and Li; and the organic-cooled reactor (0CR), which contained a mixture of polyphenyls (high boiling hydrocarbon compounds) as substitute for water as coolant and perhaps as moderator. The first two had materials problems related to containment of the fuel. Although polyphenyl compounds are relatively stable to radiolysis by ionizing radiation, they are not sufficiently stable to survive in the intense radiation field of a reactor core. Table 14-9 lists the types of nuclear power plant that existed and the numbers that were operational worldwide at the end of 1999.